I hope you all enjoy this beautiful poem by Welsh poet, R. S. Thomas. Thomas was an anglican priest, as well as a poet, but I think this piece is full of profound wisdom for everyone, regardless of creed. 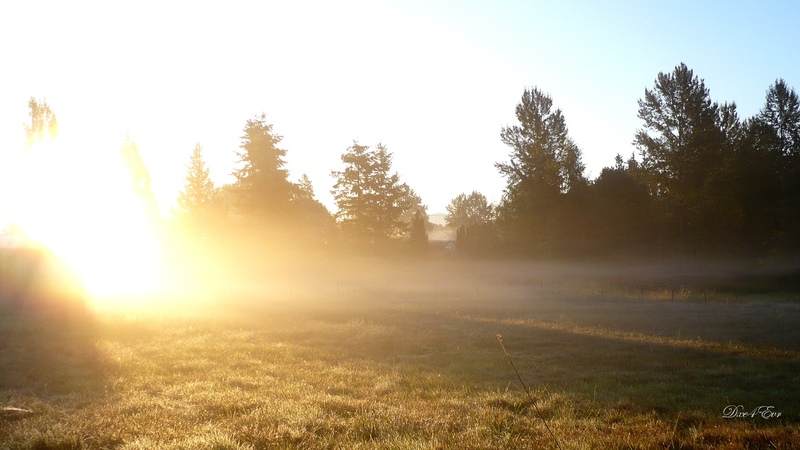 The Bright Field speaks about those shining moments in life — moments of grace, beauty, inspiration, epiphany — where we fleetingly encounter the divine or feel a deep connection to the universe. This image of the bright field evokes for me various ideas: the moment you see your child’s face for the first time, the moment you realise you’ve fallen in love, or when you read and understand some complicated scientific theory about the universe, become transfixed by Shakespeare or an incredible piece of music… or, of course, when you pray or meditate, and feel a connection to the divine. The poet confides that he has often seen the sun “illuminate a small field” for a moment, and continued on his way and “forgotten it”. But, says Thomas, he knows that that field was “the pearl of great price”; that moment was something rare and beautiful, to hold on to and spend your life searching for. He is admitting here that he has experienced moments of profound connection to God, but that he has proceeded to move on, without dwelling on it. However, he has now come to realise that he must “give all that I have/ To possess” that moment — that “bright field” — again. Another quality of these “bright” moments becomes clear as we enter the second stanza; the poem says that life is not “hurrying on/ to a receding future” or “hankering after/ and imagined past”. These lines deliver to me the notion that these bright moments of grace are in fact moments where we are intensely present. These are the moments we are most alive, and when we feel most connected to life, the universe, and/or God. This is as relevant for prayer and meditation as it is for all the other instances I have mentioned where one might experience a moment of exhilarating and glorious connection to the universe. ‘What is the world, O soldiers? I love Walter de la Mare for his capacity to conjure such startling images with clear, plain language. There is also, I think, a greatly musical quality to his poems, and Napoleon is full of all the lyrical simplicity that I admire so much about this poet’s work. This poem seems to me to be a exquisite expression of the loneliness that can surround power and aggression. 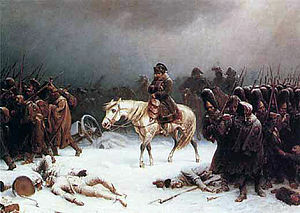 The mention of the “incessant snow” and the “northern sky” put me in mind of Napoleon’s Russian campaign, which led to his downfall and ultimate exile. The imagery in the poem evokes the disastrous Russian winter (the best weapon against invaders) and the Russian tactic of continuous retreat (each time Napoleon and his troops advanced, they met with only deserted, burnt land). The Russians burnt the land to prevent Napoleon from feeding his soldiers (he had anticipated a relatively short campaign), and this eventually forced Napoleon’s greatly diminished Grande Armee to retreat. For me, these images deliver the idea of the ego’s aggression being met with icy (and an ultimately more powerful) silence. Napoleon’s pursuit of empire through war and conquest is a perfect example of the force and violence of the ego (the poem is certainly not a condemnation of Napoleon in particular, but rather uses him as an example for all those who seek power through aggression or conquest). In the end, nature, in the form of the Russian climate, dealt with Napoleon; the Russians did not have to. I think this is such a powerful image, and one that I think de la Mare captures beautifully in this short poem. The speaker (Napoleon) begins with a question for his men; “What is the world?” he asks. Of course, he does not wait for their response, but answers himself: “It is I”. There is such clear confidence in this answer, and this seems perfectly befitting of the power-crazed, arrogant character that has been ascribed to Napoleon. De la Mare’s Napoleon is a wonderfully dramatic piece. It seems to capture the legendary quality of the man, with its grand, heroic tone, but it also illustrates the way in which ego and violence will always reach a point of burning out, or a point where there is no one left to conquer. I think the image of the “incessant snow” is a beautifully poignant one. I just imagine Napoleon staring into the silence of the snow falling — deserted, and the ground burned — and realising that there was nobody there to fight. Violence is a force that must be spent, apparently, but once it is spent; once you have slaughtered and fought and conquered — however much ground or wealth you may have gained — you still have to face the deafening silence and the emptiness of the world you have created. I think this is a wonderful poem, and a gorgeously beautiful homage to Art in all its forms. It speaks about what might be our world’s most lasting and essential legacy; “If civilisation drowns”, writes Clarke, “the last colour to go/ will be gold”. Flood is clearly set in Venice, and we can be sure of that with the expressed notion of civilisation ‘drowning’; it is a commonly-known fact that Venice is sinking and will one day be under water. 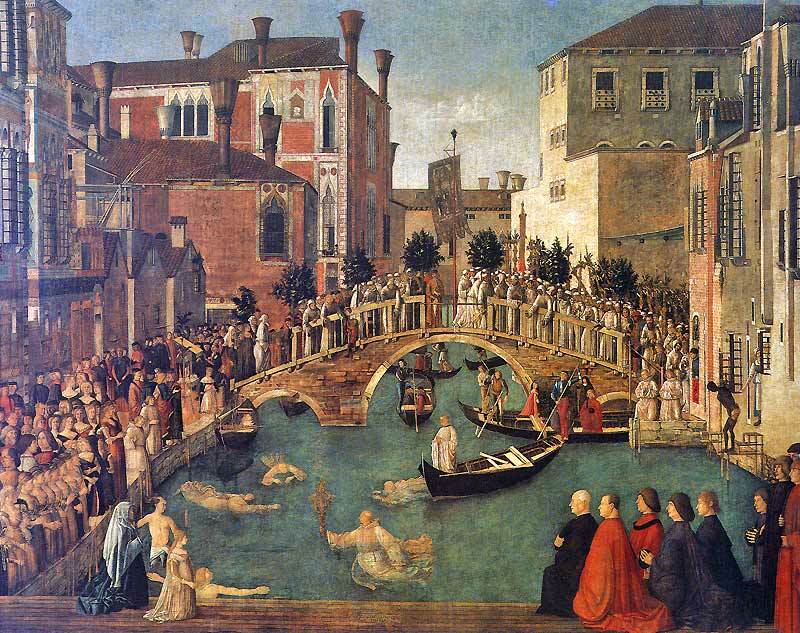 Of course, there is also the mentioning of the “prow of a gondola”, and the Venetian painter, Bellini, which helps to paint this image of Venice. Italy, with its history of the Roman Empire, and so much enlightenment and brilliant art during the Renaissance, is the ideal symbol for Western civilisation. It is also an obvious religious centre, and I think that amplifies this idea of the holiness of art. Gold is certainly a colour that I connect with Italy. So, the poem talks about what would be the last thing “to go”, should civilisation be destroyed, and what would be the first thing to “return” if we had to rebuild civilisation from its ashes. Clarke’s answer to both of these questions is simple: “gold”. For me, this gold in the poem represents Art (every form of art: painting, sculpture, poetry, music etc). Man needs Art to express what Keats called “our deep eternal theme”; we have a need to express ourselves and our experience of beauty, truth, and all that is sacred. There seems to be a distinct aura of the sacred surrounding the idea of Art (i.e. the “gold”) in the poem, hence the references to the “feathers of angels” and the “Cinquecente nativities”. I just love this piece. It reminds me of what a glorious thing Art can be. it doesn’t occur on the canvas. with a bleak white haze over its mountains. 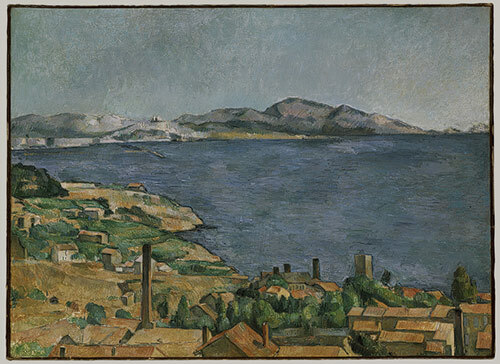 This poem is about a painting by Cezanne called ‘The Gulf of Marseilles seen from L’Estaque’. You can see the painting below. I think Cezanne’s Ports is a fascinating poem. Ginsberg fascinates (and often troubles) me anyway, but here I love how he finds such a poignant significance to this beautiful painting — significance that I admit I would not have found myself without nudging. The “meeting place”, where “shore meets shore”, is not represented in the painting; it “does not occur on the canvas.” Why does it not occur in the picture? Is it because “Heaven and Eternity” are impossible to depict in art? Because they are impossible to comprehend in life? For me, these little rowboats represent our human efforts to understand the divine — our attempts to understand “Heaven and Eternity” in life. These attempts are not futile, but they are perhaps, as I said before, sweet and trivial, when you consider how the whole of the foreground is being inescapably “swept” towards the left of the painting, and Heaven. Ginsberg was a Buddhist for much of his life, and I think that this may have influenced this poem a great deal. I think that final quotation is true and beautiful, and I also think the influences of Blake, and Buddhism are very evident there. Today I am going to kill something. Anything. a sort of grey with boredom stirring in the streets. I squash a fly against the window with my thumb. another language and now the fly is in another language. I breathe out talent on the glass to write my name. the chance. But today I am going to change the world. knows I am a genius, and has hidden itself. I pour the goldfish down the bog. I pull the chain. I see that it is good. The budgie is panicking. for signing on. They don’t appreciate my autograph. and tell the man he’s talking to a superstar. He cuts me off. I get our bread-knife and go out. The pavements glitter suddenly. I touch your arm. Education for Leisure is written from the point of view of a young person, who has presumably left school and is on unemployment benefit (every fortnight, he goes into town for “signing on”). I find the speaker’s voice at once frightening and heartbreaking; I can see that this person is capable of doing terrible things (he squashes a fly with his thumb, he wants to kill the cat, and he flushes the goldfish “down the bog”) and yet his voice also seems to contain hues of a wounded child, with lines like “I have had enough of being ignored”, and the bit about Shakespeare being “in another language”. An obviously frightening aspect to this character is that he is clearly deluded and probably a psychopath. He begins with the statement, “Today I am going to kill something. Anything.” This person is destructive, angry, and desperate. But why does he feel this need to “kill”? Why does he want to “play God”? I think one reason is that he is afflicted by “boredom”, which seems to be a result of his neglectful education. The other reason, I think, is a need to take control of a life that seems so far beyond his power to change. The second stanza is the one that breaks my heart the most. He squashes and kills a fly with his thumb, remembering Shakespeare’s King Lear from school. “It was in/ another language and now the fly is in another language”, he says. The speaker is extremely bitter about not having understood things at school, and perhaps not being given enough attention or time to improve himself. He feels like a victim, with no control over his future. So, as revenge, he imposes the same thing on the fly. The speaker tries to convince himself that he is worth something more than he has apparently been told. “I breathe out talent,” he writes; “I am a genius”. He wants to change the world — “Something’s world”. He knows that the only power his has is physical, violent power, and so the only way he can change the world is to destroy it. The poem follows his desperate search for something “to kill”. The cat hides from him, flushing the goldfish is not enough, the budgie is “panicking”, but that is not enough, either. I think the final line to this poem is brilliantly clever. If we do not care about the speaker by this stage of the poem; if we are still thinking to ourselves, ‘this person has nothing to do with me’, well, he now turns on and actively addresses the reader. The speaker in this poem is an example of a very real problem (though it was written in Thatcher’s Britain, I believe it is still very relevant), and I think it is very dangerous to ignore him. I read The Fly today and it reminded me of a line from King Lear, when Gloucester says: “Like flies to wanton boys are we to the Gods,/ They kill us for their sport.” Like that line from Shakespeare, Blake’s poem (from his Songs of Experience) explores the idea that man lives constantly under the shadow of the “blind hand” of death, just as a fly is subject to the whims of the “thoughtless hand” of man. The way Blake creates a parallel between the fly and the speaker, by likening the fly’s “summer’s play” to his own merriment of dancing, singing and drinking, creates (I think) a powerful sense of the fleetingness and fragility of life. In the face of the ephemeral nature of existence, the fly and the speaker are equal. There is something very egalitarian about this poem, because it seems to suggest that all creatures are equal in the face of mortality. 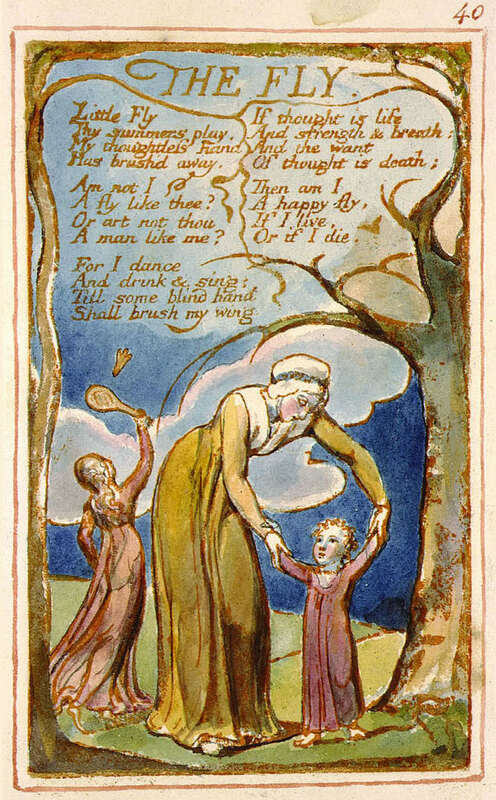 Below is the etching that Blake did for this particular poem, (he created these for all his poems in Songs of Innocence and Experience.) This etching seems to me to fit the poem perfectly. Like the poem, the image of the children and the mother figure seems perfectly innocent, just like the sing-song, nursery-rhyme tone and rhythm to the written piece. However, on closer inspection, the image becomes more sinister, and we can see that the children playing are very fragile; one plays merrily with a racket and shuttlecock, and the other needs the help of the mother as he attempts to walk. The trees that frame the image are bare, skeletal and oppressive, as if to remind us that death is never far away. the secret of the world. it is wrapped in silence”. This poem is taken from the collection of Rumi’s quatrains called Whispers of the Beloved, translated by Maryam Mafi and Azima Melita Kolin. This particular poem really touched me when I read it, and I thought it would be a lovely one to post on here. 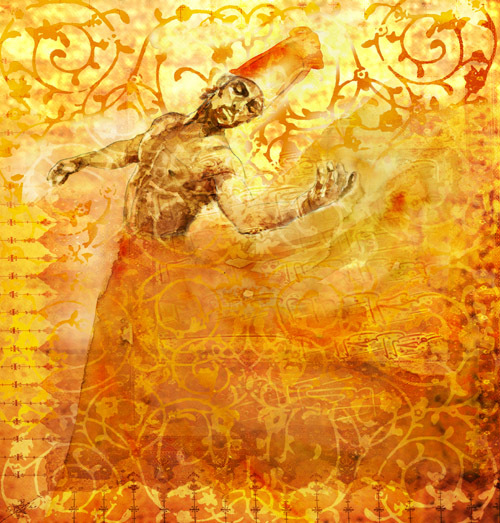 There is not much I want to say about it; my usual reaction to Rumi poems is quiet reflection! I will say, however, that the wisdom of this piece is just so beautifully expressed (beautifully translated! ), and that I am in love with that final line, “it is wrapped in silence”.